“The Maple Leaf – An Extraordinary American Civil War Shipwreck” was edited by Keith V. Holland, Lee B. Manley, and James W. Towart and first published in 1993 by St. Johns Archaeological Expeditions, Inc. In 2014, in honor of the 150th Anniversary of the loss of this ship, Dr. Holland granted Mandarin Museum & Historical Society the rights to reprint the book, which had been out of print for many years, as a 150th Anniversary edition. 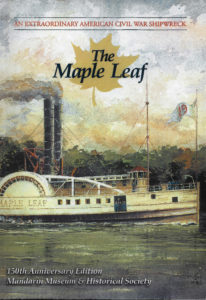 This book is the only book ever written about the Maple Leaf and it is a comprehensive work with contributions from many experts. It includes chapters about the ship itself and how it came to be a Union troop transport, the travels it made prior to coming to Jacksonville in 1864 and information about the infantry regiments who lost all of their baggage the night the ship sank. Army Board of Survey reports made by the crew in the days after are fascinating reading. And several chapters are dedicated to telling the story of the search and finding of the shipwreck site, the artifacts recovered and preserved and the legal issues related to the survey and salvaging efforts. In addition to the 1st edition, information has been added that was found after the original printing. This book is only available in the Mandarin Museum gift shop whenever the museum is open. The cost is $20 for Mandarin Museum members and $25 for non-members. The price includes sales tax. Appendix B: Plantations on the Route of March of the 112th N.Y. Inf. Vols.